The winners got goals from five different players and points from a dozen skaters while Connor Ingram got the easiest shutout he’ll ever get, stopping just six harmless shots. Only when Russia limited Belarus to six shots on December 27, 2000, has a team had so few pucks on net in U20 history. Playing in their first game of this year’s U20, the Slovaks might have been an equally physical team, but their inability to generate any offence cost them against what was an impressive Canadian attack. The final score flattered the Slovaks. It wasn’t until 5:30 of the second period that the opening goal was posted on the scoreboard. It came courtesy of a nicely executed three-on-two rush. Tyson Jost carried the puck over the blue line, and as the defence closed in on him he dropped it back to Jeremy Lauzon, trailing on the play. Lauzon had a moment to take aim and ripped a shot over the shoulder of Adam Huska. Less than six minutes later, Canada doubled its lead courtesy of a power play. This time it was a nice pass from behind the net by Pierre-Luc Dubois to Raddysh in front. Raddysh fired quickly over Huska’s glove, and the pro-Canadian crowd could breathe a sigh of relief. Canada extended its lead to 3-0 at 12:37 off the draw. Lauzon’s point shot was tipped in front by Anthony Cirelli. By this point, Canada had as many goals in the game as the Slovaks had shots—three. Canada had 23 shots. Canada got its second power-play marker of the period thanks to Thomas Chabot off a pass from Matt Barzal at 16:25, making the shots 30-3 in the process. Michael McLeod added a fifth Canada goal in the third. Canada has a day off before playing Latvia on Thursday while the Slovaks get back at it tomororw against the United States. Tuesday’s result marks an historic moment for the Danish program. 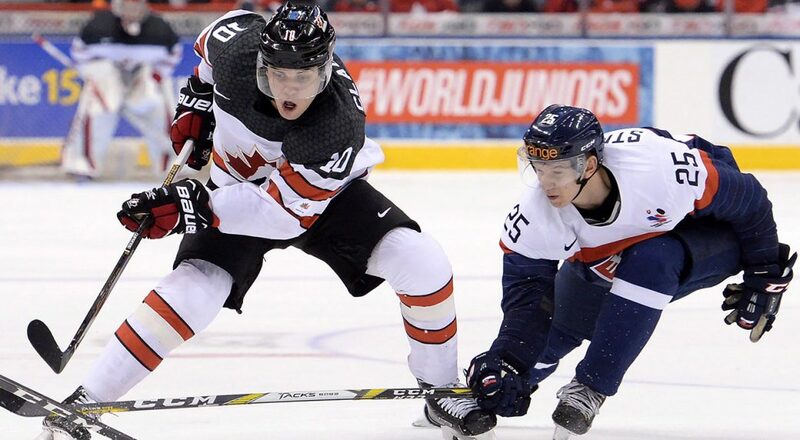 It is the first time they have beaten anyone at the World Juniors aside from two wins over Switzerland (4-3 in a shootout on 30 December 2014; 2-1 on 27 December 2015). Goalie Kasper Krog made 34 stops for the shocking victory. He might be Denmark’s shortest player at 175 cm, but the blue-masked 18-year-old from SonderjyskE Vojens stood tall in his World Junior debut, boosting his team’s hopes of making the quarter-finals for the third straight year. “It’s unbelievably tough,” said Juolevi. “It’s not easy, especially when the other team is just putting the puck into the neutral zone and you have to try to run their wall. But we should have done that. The Finns made it exciting when Bjorkqvist scored on the rush at 15:30 to cut Denmark’s lead to 3-2. But the comeback attempt was destined to fail. The Danes mobbed Krog at the final buzzer. Russia scored three unanswered goals in the first period en route to a big 9-1 win over Latvia. With the win it improves to 1-1 while Latvia falls to 0-2. The Russians were right back at it less than 18 hours after leaving the ice last night, a 5-3 loss to Canada. They scored early to take all hope out of the Latvian chances and didn’t let up. Kaprizov led the way with a hat trick and two assists. Linemates Alexander Polunin (two goals, two assists) and Mikhail Vorobyov (four assists) added to the statistical onslaught which saw the trio record 13 scoring points. Damil Yurtaikin opened the scoring when he drove hard down the left wing, outmuscled Rihards Puide, and made a nice deke on Gustavs Grigals at 5:33. Latvia had a great chance midway through the period with a four-minute penalty to Polunin, but although they had some chances, they were shut out. When Polunin came out of the box, he broke up the middle and beat Grigals with a shot along the ice between the pads to make it 2-0. Pavel Karnaukhov made it 3-0 at 17:39, giving Russia all the goals they’d need. Grigals couldn’t control Vadim Kudako’s point shot, and Karnaukhov was there to swat in the rebound. Coach Eriks Miluns inserted backup goalie Denijs Romanovskis for the second period, and he was beaten on his first shot, a close-in one-timer by Kaprizov off a nice pass from Vorobyov. Latvia’s Rudolfs Balcers finally converted on a power play at 3:42 when he made a nice toe drag and shot to the short side, beating Vladislav Sukhachyov to make it 4-1. Just 39 seconds later, though, Russia restored its four-goal lead when Polunin got his second, and 43 seconds after that Kirill Belyayev scored from in front. That spelled the end for Romanovskis, and Grigals went back into the blue ice for Latvia. The Russians added three more in the third–all on the power play–to add salt to the wound, Kaprizov with two as well as an assist on a Trenin goal. Both teams now enjoy a day off before returning to action on Thursday. Russia will play the United States in a much-anticipated matinee while Latvia plays Canada in the evening. Budding superstar Nico Hischier scored the overtime winner at 0:23 and added two assists as the Swiss topped the Czechs 4-3 in their opener on Tuesday. Swiss assistant captain Damien Riat fed Hischier a breakaway pass and the 17-year-old sniper from the QMJHL’s Halifax Mooseheads beat Czech goalie Jakub Skarek through the five-hole. “It’s a great feeling to score in overtime,” said Hischier. Riat also had a goal and two assists. Captain Calvin Thurkauf added a goal and a helper, and Loic In Albon also scored for Switzerland. Goalie Joren van Pottelberghe shone with 36 saves. The last time Switzerland won a preliminary-round game was two years ago on this date in Toronto, and it was a 5-2 win over the Czechs. Switzerland, under new head coach Christian Wohlwend, is looking to improve on back-to-back ninth-place finishes at the last two World Juniors. The Swiss face Sweden next on Wednesday, and the Czechs will battle Denmark on Thursday. Filip Chlapik scored twice for the Czechs and Radek Koblizek added a single. Michael Spacek and Jakub Zboril each contributed two assists. The Swiss showed resilience in pre-tournament play when they rallied from a 3-0 deficit against Canada before losing 4-3 in overtime. That quality was evident again in their Bell Centre debut, as they were outplayed early on, but found a way to succeed. The Czechs, who last won World Junior gold in 2001, are usually among the tournament’s most mercurial squads. And after edging defending champion Finland 2-1 in their opener, they couldn’t down a lesser opponent despite outshooting Switzerland 39-22 — even though they came back after trailing 3-1. In a fast-paced, scoreless first period, it was a rough welcome back to the World Juniors for Riat. He collided heavily with Zboril, a big Czech defenceman, in open ice, and later took a puck in the face. Shots, meanwhile, favored the Czechs 9-3 through 20 minutes. The Czechs couldn’t neutralize Hischier. In the 2017 NHL Draft, he could supplant Nino Nieddereiter (chosen fifth overall by the New York Islanders in 2010) as the highest-drafted Swiss ever. In this game, he exceeded his entire output at last year’s tournament in Helsinki (two assists in six games). Halfway through the second period, Hischier deftly centred the puck from the side boards to In Albon at the hash marks. In Albon, a 19-year-old World Junior rookie who plays for Lausanne, squeezed a quick wrister through Skarek. The Czechs ran into penalty trouble, taking three straight minors, and the Swiss made them pay with the man advantage. With 3:57 left in the middle frame, Riat took a pass from Hischier and unleashed a shot from the slot, forcing Skarek to make a left pad save. Thurkauf banged in the rebound for a 2-0 lead. At 5:02 of the third, the Czechs got some life when Koblizek scored to make it 2-1, taking a pass from Zboril on the rush and zipping one over van Potteberghe’s glove. But Zboril was sent off for cross-checking Yannick Zehnder from behind into the boards, and the Swiss quickly capitalized. Riat stretched the lead to 3-1 at 8:34 when he zipped a high shot from the middle past Skarek, with Thurkauf screening in front. “Our special teams were good, especially the power play,” said Wohlwend. The Czechs made it 3-2 just over two minutes later with a power play goal of their own. From the top of the right faceoff circle, Chlapik sent a zinger past van Pottelberghe. Hischier was nearly the goat, as he was in the penalty box for high-sticking when the Czechs tied it up with 17 seconds left and their goalie pulled. Spacek, who scored the winner versus Finland, sent it to Chlapik and he cashed in from the faceoff circle. “I think we played a really good third period,” said Chlapik. But it wasn’t enough. This was the third Swiss victory over the Czech Republic in World Junior history. The first one came in the 1998 bronze medal game (4-3 in a shootout) in Helsinki. 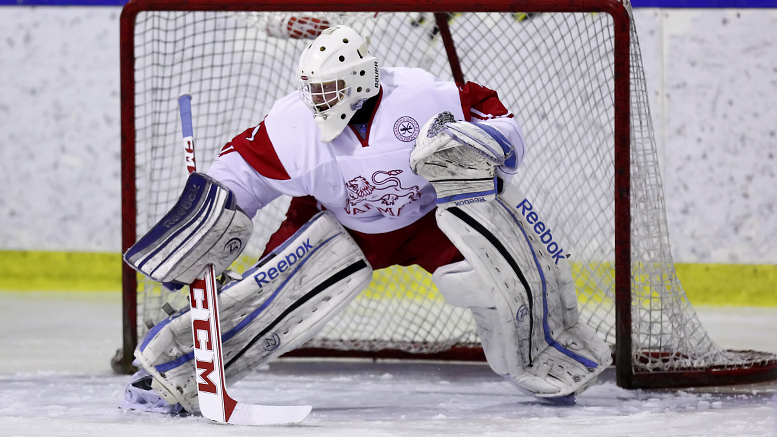 It was a successful Spengler Cup debut for HK Mountfield. The team from the Czech city of Hradec Kralove won in its first ever appearance in Davos 4-3 on Tuesday afternoon. The celebrated match winner for Mountfield was Richard Jarusek. The 1.89 metre tall, 98 kilo forward scored the game-winning goal on the power play 245 seconds before the end of regulation. The 25-year-old had already tied the game at 1-1 on the man advantage. Dmitry Monya put Yekaterinburg ahead after 31 seconds – the fastest goal so far at the 90th edition of the Spengler Cup. Then Mountfield dominated the opening period – in part due to four minors against the Russians. However, only in the 24th minute did Roman Kukumberg give the Czechs a 2-1 lead. In this even game, Anatoly Golyshev (38.) and Michal Caykovsky (40.) temporarily turned the score in favour of Yekaterinburg shortly before the end of the middle period. Kukumberg (53.) tied it up at 3-3 with his second goal, igniting an exciting final stage of the game, in which Jarusek, the second Czech two-goal scorer, completed the final score. The deciding game in Group Torriani between HC Lugano and Mountfield will take place on Wednesday afternoon. The winner will take the group and secure a direct semifinal berth. Team Canada won the Spengler Cup classic against HC Davos 4-3 on Tuesday night. The Canadians scored twice on the power play and once short-handed. HCD and Team Canada offered the sell-out crowd of 6300 at Vaillant Arena – amongst them Guy Parmelin, the Swiss Minister of Sport – a fast-paced, exciting offensive display. Better efficiency on the finish and two – from Davos’ point of view – unlucky situations leading to goals made the difference. The Canadians took a 2-1 lead short-handed (!) after a failed line change by the home team. Cory Emmerton took advantage of the breakaway. The team from overseas then took the lead again when Jacob Micflickier netted the 3-2 on the power play, after HCD defensemen Forster received a minor for lifting the puck over the glass in his own defensive zone. The visitors also showed their efficiency on the power play when Andrew Ebbett left the keeper no chance on a redirected shot by Chay Genoway. Per Ledin, on loan from Lausanne, scored the 1-0 and 4-3 for Davos. HCD defenseman Daniel Rahimi had temporarily tied the game at 2-2 with a long-range shot. Despite the 4-3 victory, the Canadians cannot win the group due to their lopsided 7-4 loss versus Dynamo Minsk the night before. HC Davos and Dynamo Minsk will face off with first place on the line on Wednesday night.